Windows 10 brings our most loved start menu back, with many options to customize start menu as per user preferences. 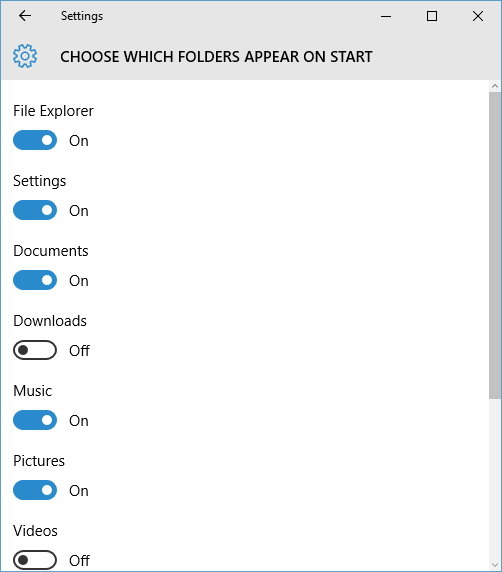 Folder shortcuts in start menu is one of cool features using which you can add shortcuts for most commonly used favourite folders like Settings, File Explorer, Music, Pictures, Videos, Documents, etc. in Windows 10 start menu. Follow below quick steps to customize folder shortcuts in Windows 10 start menu as per your preferences. Open Windows 10 "Settings App" by clicking Settings shortcut in start menu or by typing Settings in Cortana Search box and selecting "Settings". Click on "Personalization" in Settings App. Select "Start" in left pane in "Personalization Settings" screen. 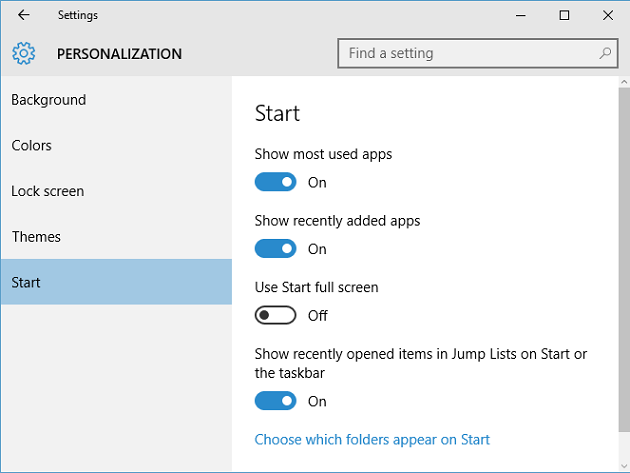 In right pane, click on "Choose which folders appear on Start" link to open Folder selection screen for start screen. Folder selection screen will show list of all of folders for which you can add start menu folder stortcuts. Current available options are File Explorer, Settings, Documents, Downloads, Music, Pictures, Videos, HomeGroup, Network, and Personal folder. To add folder shortcut to Start menu, set toggle button to "On" under folder name. To remove folder shortcut from Start menu, set toggle button to "Off" under folder name. Folder shortcuts is one of great feature in Windows 10 which makes accessing frequently needed folders easier!